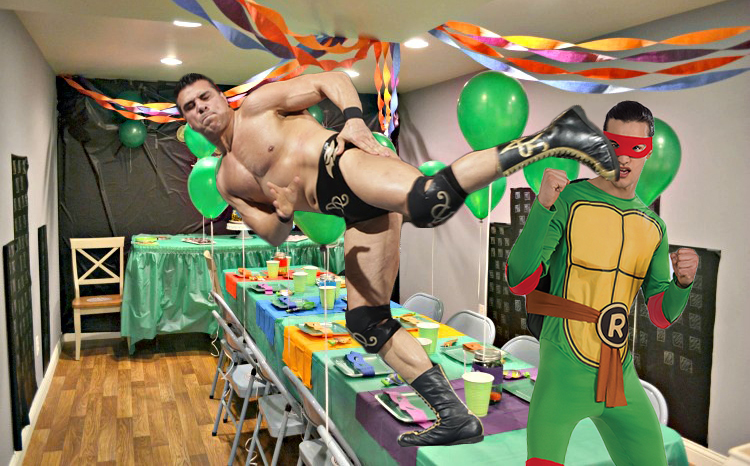 Headlies: Alberto Del Rio Beats Up Ninja Turtle At Child's Birthday Party - WrestleCrap - The Very Worst of Pro Wrestling! Las Cruces, NM – Former WWE Superstar Alberto Del Rio is once again in trouble with the law after assaulting another person in a Ninja Turtles costume. The police department are still trying to piece together exactly what happened, but it is believed Del Rio, along with his fiancee, current WWE wrestler Paige, were driving to the airport from an independent wrestling show when Del Rio made an abrupt stop at Kidz Zone Mini Gold and Party Palace. It took over 10 police officers and deputies to subdue the former World Heavyweight Champion and take him into custody. The Kidz Zone employee, 22 year old David Zalinsky was taken to Memorial Medical Center where he was treated for a broken orbital bone, a broken nose, a swollen jaw, and a dislocated shoulder. 13 Responses to "Headlies: Alberto Del Rio Beats Up Ninja Turtle At Child’s Birthday Party"
I don’t know the backstory on this, but picturing Paige saying “Alby Walby” makes smile on this cold Monday morning. That story misses the later development that what set Del Rio off was Not-Rafael WALKING PAST Paige on a staircase. It cannot be ruled out that he glanced at her. How about a card featuring Lucha Underground vs TMNT? We can call it Teenage Lucha Ninja Tortillas. main event could be a Survivor Series style match featuring Del Rio, La Parka, Rey Mysterio, Prince Puma and Paige vs the TMNT & April O’Neill. This must happen. This simply must happen. Don’t forget his brother should also be in the match so Alberto he can beat him to a bloody pulp at the police station afterwards. Imagine the hilarity that could result from Dr. D David Schultz out and about ” lookin’ for a woman” and seeing Paige (soon to known as Pay-Ge on the indy circuit) and having Alberto yell at him for “looking at his woman”. We know that Alberto Del Rio can take on Ninja Turtles. Question is can he take on Ultraman? Another question is: can he take on Optimus Prime and win. And as Robot Chicken told us, there was minimal difference between the Ninja Turtles and the Street Sharks. That last line is amazing. I had no idea Mr. Dallas was involved. 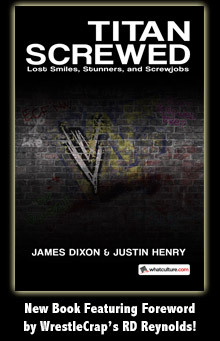 INDUCTION: WCW on the Dating Game – Featuring Muppets, Clowns, and Pantsless Chris Jericho. You’ve Been Warned.